Can You Get Addicted to Imodium? Imodium is an over-the-counter medication, which is typically used to prevent the occurrence of diarrhea. In light of recent events, many people are asking: can you get addicted to Imodium? We know that Imodium, or loperamide hydrochloride, also slows down the intestinal movement and digestion. However, this drug has also been known as the “poor man’s methadone.” Through the epidemic of the opioid crisis sweeping the country, Imodium abuse has led to another form of dangerous substances that experts did not see coming. Addicts who cannot obtain painkillers have been turning to this drug as well as other anti-diarrhea medications. The active ingredient in Imodium, loperamide, can give a cheap high if consumed in extraordinary amounts. While this substance can cause extreme constipation, it can also be toxic and deadly to the heart. Until recently, we didn’t know that getting high off Imodium was even possible. Additionally, the anti-diarrhea drug can alleviate the severe gastrointestinal symptoms of opiate withdrawal. Of the millions of people thought to be using heroin and painkillers, all are at risk of overdose and horrendous withdrawal symptoms. However, some of these individuals are using Imodium in high doses to manage these symptoms. While Imodium is considered to be an opioid agent, it is not exactly an opioid. However, when taken in large doses it binds to the same receptors as opioids. As an opiate receptor antagonist, the anti-diarrhea drug continuously signals opioid receptors, though does not activate opioid receptors the same way as replacement medications like buprenorphine. According to a study published in the Annals of Emergency Medicine in 2016, taking large doses causes Imodium to act similarly to drugs similar to heroin and oxycodone. Can you overdose on Imodium? An additional report published in the Annals of Emergency Medicine recently described two deaths in New York after Imodium abuse. Overdoses have been also linked to deaths or life-threatening irregular heartbeats in at least a dozen other cases within the last 18 months. There is little data on this increasingly widespread problem, however, many toxicologists and emergency department doctors suspect it is more widespread than suggested. Recently, the Food and Drug Administration has asked manufacturers of over-the-counter anti-diarrhea treatments to change the way they package their products to curb abuse by people with drug addictions. When Imodium was first under clinical trials, the DEA placed the medication on the Controlled Substances list under Schedule II – the same category that medications like oxycodone and hydrocodone were listed. However, in 1976, the DEA rescheduled loperamide as a Schedule V drug saying that the substance was essentially harmless. The doses required for the euphoric effects are typically anywhere from 50 to 300 pills a day. 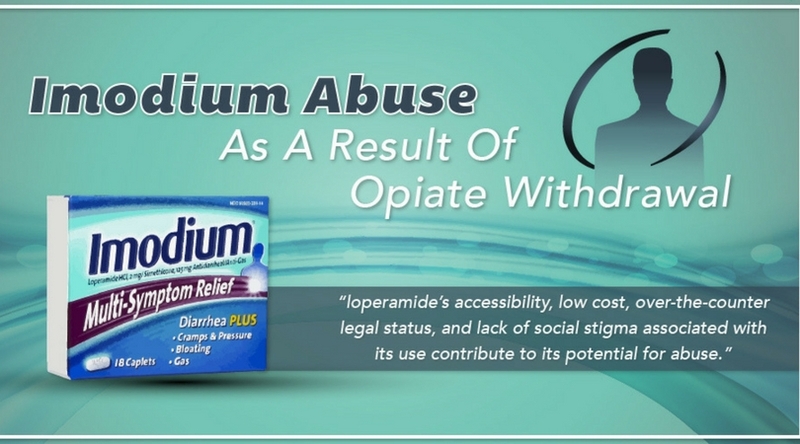 There is a misconception that because something is illegal it is considered safe, however, its potential effects and the fact that people are struggling with opioid addiction and using Imodium, a person can easily become addicted to the drug. While Imodium is safe at recommended doses, it’s very unsafe at high doses which are often taken by users to achieve opioid-like effects. If you or anyone you know struggles with abusing Imodium or any other opiates (or opiate-related drugs), reach out to us for an assessment. Our dedicated team of addiction professionals is experienced in helping people that abuse Imodium and all opioids. We specialize in opioid addiction treatment that focuses on healing the mind and body so that our patients have the tools necessary for long-term recovery.